Sitka is located on Baranof Island, surrounded by some of the best fishing waters on the planet. Fishing in Sitka focuses on a variety of world-class game fish, including trophy sized king salmon and halibut. At Kingfisher Charters & Lodge, we are eager to share our love of fishing with all of our guests. The Alaska Department of Fish and Game's catch statistics reveal that Sitka has some of the best catch rates in the entire state. Not only is Sitka directly adjacent to migratory ocean salmon lanes, it is also situated alongside many nearby islands, making it possible to go fishing even when the weather isn't suitable to fish the ocean. These waters, among the archipelago of the Inside Passage east of Sitka, make it possible to get out of the wind and waves by fishing the waters leeward of the coastal shores. Indeed, there are many reasons why Sitka stands out to discerning anglers, but everyone agrees that the main draw is the incredible fishing for multiple species each day. Salmon runs in Sitka defy the imagination and make every fishing trip hard to forget. It's possible to target all five salmon species, but we focus our Sitka fishing efforts on the one-two punch of king salmon and silver salmon. King salmon around Sitka run between 20 and 70 pounds, and fishing for them in saltwater ensures that they are in prime condition. These chrome-bright feeders are easy to distinguish from their spawning brethren, because they put up an unforgettable fight against any angler lucky enough to fish for them. Silver Salmon in Sitka run large, up to 18 pounds, and fishing for plentiful, leaping "coho" will put a smile on your face and leave your arms sore. By targeting Sitka salmon with both trolling gear and mooching gear, we are always ready for whatever fishing method will work best on any given day. This sets us apart from other fishing charter outfits in Sitka that may be a little set in their ways when it comes to fishing techniques. No Sitka fishing trip would be complete without trying your luck for a barn door halibut. We do our halibut fishing in waters free from strong tidal currents, and around Sitka 30-50 pound fish are common, and a true lunker could be a cast away. 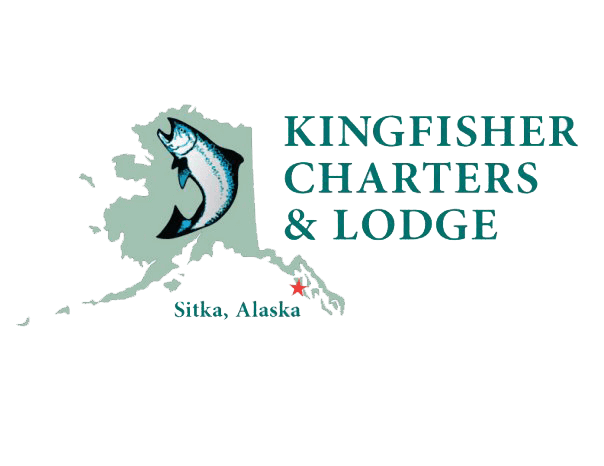 Kingfisher Lodge is the premier Sitka fishing destination, and we would love to have you as one of our guests. Modern amenities, incredible dining, and laid back comfort await you after every day spent fishing. Whether you are coming to Sitka for a fishing trip with your fishing buddies, or with your family, we want to make sure that you have the trip of a lifetime.